Baking and Mistaking: 1,2, Cake! Simple and pretty...and pretty simple too, is this chocolate filled and frosted layer cake. The cake itself is adapted from Paula Deen's 1-2-3-4 Cake, and there the problems begin. 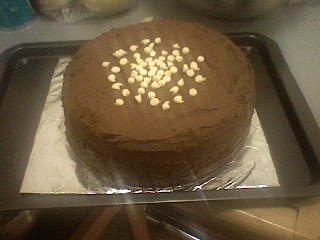 Paula's cake makes a 3 layer cake that you then fill and frost - but I thought that would be a little much for the gathering - and a little much work for me! So I decided if I took 2/3 of each ingredient, I would end up with a 2 layer cake - perfect! This however, involves lots of math - not my strong suit - and resulted in me dashing back and forth between the kitchen and the computer, checking and double checking my calculations, and a solid minute of thinking hard about why the amount of butter seemed wrong, before I realized I needed 1 1/3 sticks of butter not 1 1/3 cups. Nevertheless, all the numbers added up, and before long I had two 9 inch pans of batter. Now came the baking. Unfortunately, I have just a teeny little oven here, and I couldn't fit them both side by side. Being exponentially too impatient to bake them separately, I managed to fit them in on a diagonal, meaning one cake was a little farther back in the oven than the other. You baking purists are probably cringing at this point, but work with me here. So anyway, I figured I should switch their places in the oven half way through, so one didn't brown more than the other - a daring but dangerous feat. I pulled it off with only one almost drop. Note to self: do not attempt to adjust the dials while wearing oven mitts. You'd think that was common sense, but I guess not so common for all of us! Once the layers were removed and cooled, the frosting began. I made the frosting from scratch, just a mix of butter, powdered sugar, cocoa powder and boiling water. I'd provide the measurements, but as I peered into the bowl worrying if it would be enough, I added a little bit more water and a little bit more sugar until I prayed it would cover the cake, and have no idea what the actual amounts ended up being. No worries, the amount was just right, and I sprinkled a few white chocolate chips on top for decoration. Of course, my biggest problem was once again transportation, so without my handy dandy cake carrier I scrounged up a piece of cardboard (I knew saving all those boxes would come in handy one day) cut it down to a square, covered it with foil, placed it on a baking sheet, and covered the whole thing with an upside-down metal bowl to help it stay fresh. Success! Though I probably looked a little strange walking down 3rd avenue with that contraption. Oh well. Tip of the Day: When frosting a cake, place a dab of frosting in the center of the board before putting the first layer down, to help it stay in place.